I felt it’s a good time to update my Elliott Wave count for the Bitcoin chart after the great run it’s had over the past two months. I’m sticking with charting Bitfinex price even though their price has diverged to a higher price compared to other exchanges. The exchanges are still moving up, along with Bitfinex, so I feel this is valid. Currently, I have Bitcoin price in the heart of a wave 3 move, in wave 3 –  of P3. This is exactly the type of wave that makes new all time highs in assets. Please review the Daily price chart below for the update to the count. The fibonacci targets for this wave 3 –  – P3 move are between 1585 and 2208. Since 1585 has already been broken, and the 1.62 * 1 –  move for 3 –  has not yet been met, I feel that there is more room for BTC price to continue higher. Once the end of the wave 3 –  move is found, expect a triangle or flat correction for wave 4 –  before another high above the previous 3 –  peak. Here’s an excerpt from page 80 of the “Elliott Wave Principle” book by Frost and Prechter, that explains the behavior of wave three moves in detail. Given the continuous rise since the low at 888, I feel this is definitely a wave three move. Third waves – Third waves are wonders to behold. They are strong and broad, and the trend at this point is unmistakable. Increasingly favorable fundamentals enter the picture as confidence returns. 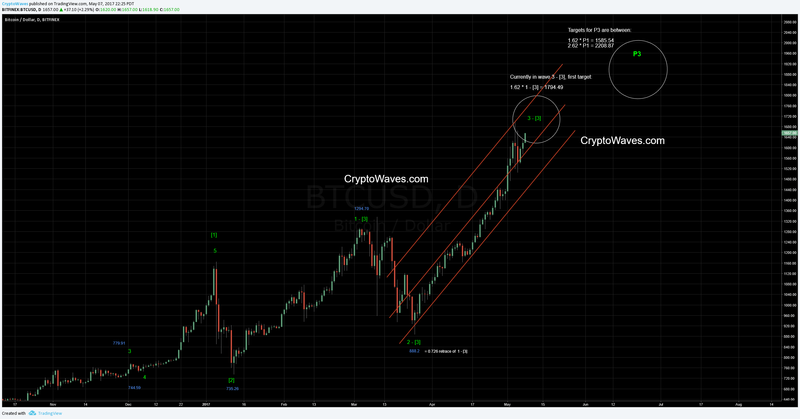 Third waves usually generate the greatest volume and price movement and are most often the extended wave in a series. It follows, of course, that the third wave of a third wave, and so on, will be the most volatile point of strength in any wave sequence. Such points invariably produce breakouts, “continuation” gaps, volume expansions, exceptional breadth… and runaway price movement, creating large hourly, daily, weekly, monthly or yearly gains in the market, depending on the degree of the wave. Yes, I have a count update I’ve been working on. Looking to post it early Monday.